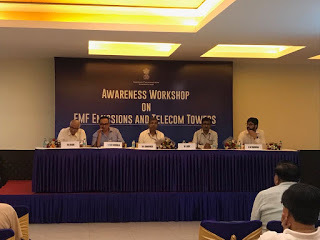 Under, a nationwide public outreach campaign to dispel myths about EMF Emissions, an awareness programme was organised by the Department of Telecommunications (DoT), Ministry of Communications on Electromagnetic Field (EMF) Emissions and Mobile Towers on Friday at Silver Oak Hall, Sports and Cultural Club, Sector 15A, Noida. Shri N.K. Chhoker, DDG(C), Delhi LSA, DoT; Shri Anand Shukla, RWA President, Sector 15-A, Noida, Shri V.K. Roy, Director (C), Dr. T.K. Joshi, Advisor, Ministry of Environment, Forest and Climate Change graced the occasion as the speakers on the dais. An expert panel comprising of telecom officers and doctors presented the scientific facts clarifying various myths on perceived health hazards from mobile tower radiation. In his technical address, Shri V.K. Roy, Director (C), Delhi LSA displayed TARANG SANCHAR, which is a web portal for information sharing on EMF and compliances has been launched by DoT for public. He gave a real time view of features of TARANG SANCHAR portal and its utilities for knowing the compliance status of towers in any locality and way to raise request for measurement of EMF emission at any place. “Scientific evidences available in the public domain do not support any harmful EMF radiation from mobile towers. In fact, the radiations norms in India are well below the safe limits prescribed by the International Commission on Non-ionizing Radiation Protection (ICNIRP) and recommended by the World Health Organisation (WHO).” Stressing upon the need of installation of required number of towers in various localities for best wireless connectivity and Quality of Service (QoS), Shri Roy sought for a greater public support. Shri Anand Shukla, RWA President, Sector 15-A, Noida, commended Department of Telecom for organising this EMF awareness program as well as connecting with the public. He said that such programmes would act as a capacity-building step between the authorities and the public and help in removing the myths in the minds of public. Shri N.K. Chhoker, DDG(C), Delhi LSA, DoT also elaborated the role of Telecom Enforcement, Resource and Monitoring (TERM) Cell and mechanism to ensure EMF Compliance in Delhi NCR Area. This program is in continuation of the awareness drive initiated by Department of Telecommunication in the year 2016. He also informed about various processes followed by TERM Cell for ensuring compliance in this regard. He conveyed his sincere thanks to RWA Noida Sector 15-A for building a platform to spread awareness on EMF Emissions. “DoT has provided a Strict monitoring and enforcement mechanism for EMF-related compliances. Any BTS site found violating the EMF norms would be penalised by 10 lakh per BTS per incidence and in case of persistent violation, closing of BTS site will be recommended by TERM cell.” Shri Chhoker stated. Dr. T.K. Joshi, Advisor to Ministry of Health, Govt. of India referred to the EMF Project established by WHO, in which over 50 national authorities and 8 international organizations are involved. He said that together, since 1996, they have been reviewing scientific information to provide scientifically sound and objective answers to public concerns about the possible hazards of low-level electromagnetic fields. Despite extensive research, to date there is no evidence to conclude that exposure to low-level electromagnetic fields is harmful to human health. The WHO has also reviewed over 25,000 articles and found no link of mobile tower EMF emissions and any adverse impact on human health. The DoT has already prescribed strict precautionary norms for exposure limit for the Radio Frequency Field (Base Station Emissions) which is ten times more stringent than the existing limits prescribed by ICNIRP and recommended by WHO. “India follows much stricter norms than any other developed county. Moreover, the Government of India has frequently monitored the whole process to ensure that Telecommunications Service Providers strictly adhere to these prescribed norms”, Dr. Joshi added. The awareness programme concluded that towers in the Noida are safe and TERM Cell is fully committed and geared to ensure compliance of guidelines designed for safeguarding our citizens. The awareness program concluded with an interactive Q&A session between senior government officials and participants from civil society, where a resident was also advised to use good quality handsets as well. The Department of Telecommunications, abbreviated to DoT, is part of the Ministry of Communications of the executive branch of the Government of India. It’s mission is to develop a robust and secure state-of-the-art telecommunication network providing seamless coverage with special focus on rural and remote areas for bridging the digital divide and thereby facilitate socio- economic development; create an inclusive knowledge society through proliferation of affordable and high quality broadband services across the nation; reposition the mobile device as an instrument of socio-economic empowerment of citizens; make India a global hub for telecom equipment manufacturing; promote development of new standards to meet national requirements; attract investment, both domestic and foreign and promote creation of jobs.